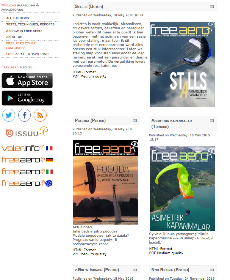 Free.aero is becoming more international by the day! In response to popular demand, we will be publishing some of our articles in other languages. These extra issues add to our portfolio of regular editions in English, French, German and Italian. Happy reading and safe thermalling to all our new readers in these countries. A battery, up to the toughest race? Pilot and film maker, Jean Baptiste Chandelier has just released an impressive new video clip. Which weather forecast for tomorrow? From the 21st to the 28th of October 2015 the Paragliding World Cup flew to Bollywood and beyond and, despite initial fears, there weren’t too many cases of Bir Belly even by the end of the competition. The hardest hike and fly race in the world wasn’t too hard for Chrigel Maurer. For the fourth time he arrived far ahead of the others, in eight days, four hours and forty two minutes. Whilst the other competitors have got until noon on Friday to battle it out, we are publishing this portfolio with the best moments of the race for the top places.